So I am so excited about the response I have gotten from my menu planning posts. It is totally inspiring me to keep at the menu planning. 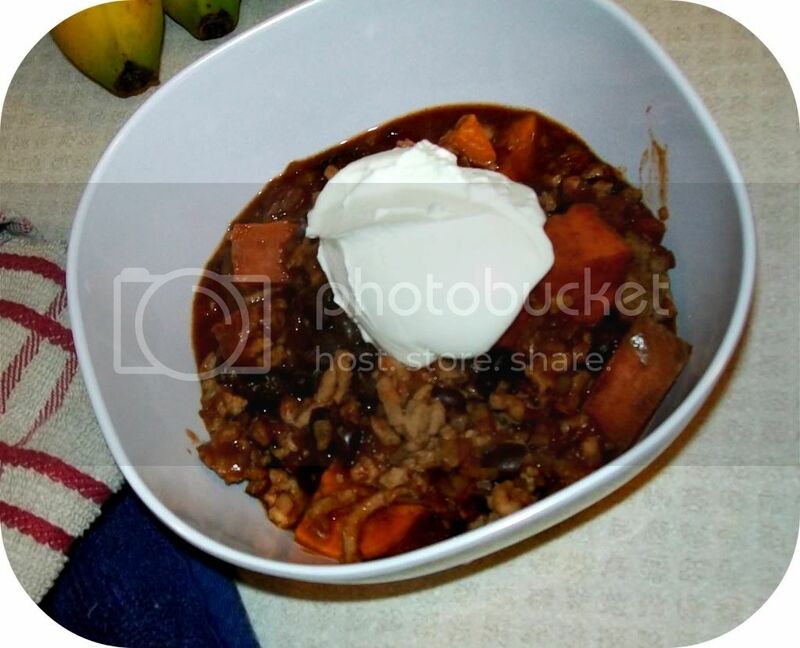 I had a few people ask if I would post the recipe for my black bean and sweet potato chili. Well this was a new recipe I had wanted to try. When I went to make it, I realized I was missing a few ingredients that the original recipe called for. I decided to just wing it and make up my own recipe, loosely based off the one I found in this book . My hubby said this was way better than any other chili I have made. Score! He loved it! Here is what you need and how I did it. Hope you enjoy it just as much as my family and I did. Brown Turkey in a skillet (I seasoned my turkey with Lawry's seasoning salt). Drain. Put all ingredients into a big pot and bring to a boil. Simmer until potatoes are tender. About 15 minutes. Spoon into bowl and top with sour cream and shredded cheese. I also served it with Jiffy Cornbread Casserole. It was delicious! My sister got me hooked on Glee about a year ago. LOVE that show! Have you guys tried TVP in place of ground meat? It takes on the flavour of whatever your cooking with and for my family of four I use about 50 cents worth to make a large quantity of chili! I made this chili last week. It was fabulous and we had enough left over (just two here) for another night.